The FAST TRACK v1.10.0 release of eZ Platform and eZ Platform Enterprise Edition is available as of June 28, 2017. This release introduces the ability to add tables in the RichText editor, enabling you to list up tabular data using table headings, merged table cells and more. This is a first step. We aim to provide more in terms of table support in the editor later. For the time being images and embedding are not supported within the table, as you won't be able to move them out or edit them. We also don't provide yet ability to style the table within the editor. This is a new way to handle design, theming and design overrides, similar to what we had in eZ Publish. It enables you to define different Themes which are collections of assets and templates. 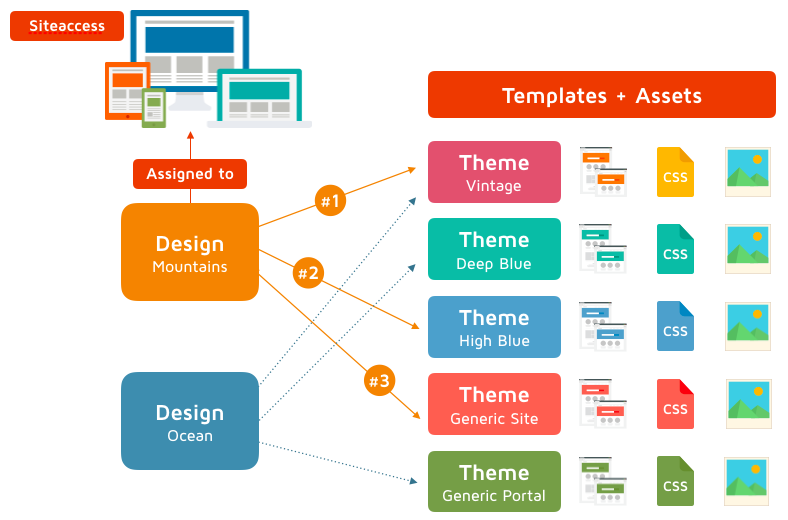 You can then assemble Themes (that can override each other) to define Designs, and eventually, assign a Design to a SiteAccess. This is a powerful concept that we will aim to use in our out-of-the-box templates and demo sites. It comes especially handy when using eZ Platform for a multisite installation and willing to reuse design parts. Further info can be found in the Bundle documentation. As part of ongoing effort to simplify everyday aspects of the API for v2, one notable part that did not cause any BC was added to v1.10, enabling you to simplify how you deal with SiteAccess languages and translations. One of the new features in 1.10 (Solr Bundle 1.4) is the possibility to configure index time boosting, which enables you to properly tune the search results to be relevant for your content architecture. In addition to that, we made progress on providing native support for faceted search within eZ Platform when using the Solr Bundle. You can now use facets based on ContentTypes, Sections and Users, see Browsing, finding, viewing page for how to use them. We plan to provide more facets natively in the coming releases. Starting with 1.10, a new command ezplatform:io:migrate-files has been added, allowing you to migrate files from one storage to another, for instance file system to S3, or S3 to NFS or opposite. For documentation check the technical feature documentation for now. EZEE-1411: Schedule block logic has been updated and improved. DEMO-102: NovaeZSEOBundle is now included in Studio Demo. NovaeZSEOBundle includes a new Field Type that lets you manage your SEO strategy in very advanced and powerful ways. DEMO-100: We also improved the way we provide personalization in the site using a profiling block (DEMO-94) and letting the end user manage their preferences by themselves. In this new version, the end user, once logged on the site, can access a page where they can define their content preferences. See here for more information. Kudos to @emodric for the Tags bundle, @pspanja for the work Solr index-time boosting, @plopix for the NovaeZSEOBundle, @jvieilledent for the initial work on the design engine and to all others who contributed bug reports, feedback and comments that made this release possible. To update to this version, follow the Updating eZ Platform guide and use v1.10.0 as <version>.